If you are reading this article to discover the secret to finding ‘better’ work that has the ‘perfect’ purpose from someone who has completely figured it out, you will be disappointed. This article instead is meant to encourage you to seize your purpose now in your current work, and stop waiting for a silver bullet or the ‘right’ job to come along. Why? Because you are always working (whether it is a corporate role, volunteering, advancing your education, organizing your retirement, pursuing a hobby, managing your home or raising a family), and to be happy each moment, we need to learn how to derive purpose from whatever it is we’re working on, regardless of the circumstances we find ourselves in. It’s easy to identify peak performance when it happens. Employees working at their peak typically loose themselves in a project or in a discussion with a colleague, client or customer. They may lose track of where they are, what time it is, even what day it is or whether or not they are hungry. Mihaly Csikszentmihalyi showed that people do their absolute best when they are in a state of mind he famously named flow, a state in which they become riveted and at one with what they’re doing. When I am at work at Prominence, I have definitely found myself forgetting the time of day or that I cruised straight through lunchtime without eating. At the time, I didn’t realize these were moments of peak performance, or ‘flow’, but I knew I was enjoying myself and wanted to keep going. These moments can exist for you, too. You just have to identify where this ‘flow’ can naturally be found in your work. The intent was to find the perfect combination of all three areas and to guide our team members to that ‘Sweet Spot’ where everything in the Venn Diagram overlapped. Looking back at the moments of ‘flow’ I’ve had in my work, I realized they really came when I found tasks or projects in this ‘Sweet Spot’ or area of overlap. 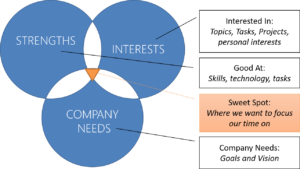 But how often do your Strengths, Interest and Company Vision really overlap? Personally, I reach that moment of flow when I am figuring out how to tackle a new challenge that doesn’t have an obvious solution. I enjoy articulating the problem and visualizing a framework by which to solve it. This often involves research, talking with experts and illustrating your points via PowerPoint. Luckily Prominence gets to engage with customers in solving their biggest challenges, so I am set for future moments of flow! If you are interested in solving problems or have a problem to be solved, let’s talk!